European human rights organization honors lawyer for legal aid to wife of terrorist responsible for 2014 Jerusalem synagogue massacre. The father of a terrorist responsible for a deadly attack on a Jerusalem bus two years ago was honored this week by a French-based international ‘human rights’ organization for his legal representation of the wife of a terrorist responsible for a synagogue massacre three years ago, Yisrael Hayom reported. The recipient of the award, attorney Muhammed Allyan, is the father of Bahaa Allyan, one of two terrorists responsible for the October 2015 bus attack which left Haviv Haim, Alon Govberg, and Richard Lakin dead. 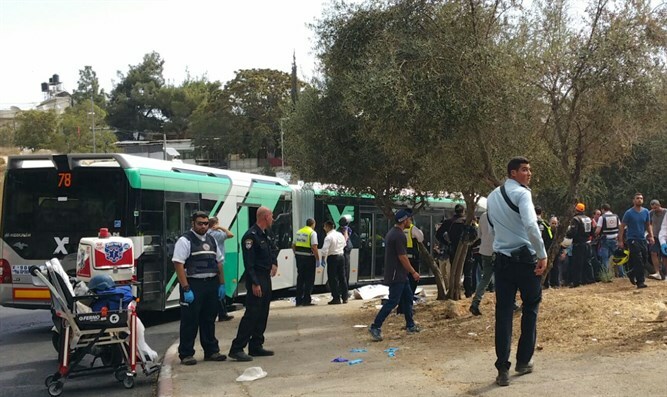 On October 13th, 2015, armed with knives and a firearm, Bahaa Allyan and Bilal Abu Ghanem attacked passengers on the number 78 bus in the Armon Hanatziv neighborhood of Jerusalem. On Sunday, Muhammad Allyan was honored at an event in Al Quds University’s Abu Dis campus sponsored by the Geneva-based International Institute for Human Rights and Peace and the Caen Memorial for Peace. Allyan won the International Pleading Competition of Palestine prize, an annual award given as part of the International Human Rights Competition for Lawyers. The prize was given for Allyan’s defense of Nadia Abu Jamal, the wife of Ghassan Abu Jamal, one of two terrorists responsible for the 2014 Har Nof synagogue massacre. During the attack, Abu Jamal and his cousin shot, stabbed, and beheaded four Israeli-American rabbis and gunned down a Druze police officer before being shot and killed. Nadia Abu Jamal, who police say expressed support for the massacre and had prior knowledge of her husband’s plans, was stripped of the Jerusalem residency permit she had been granted and lost coverage from Israel’s healthcare insurance. In response, Abu Jamal sued the state, taking Muhammad Allyan as her legal counsel. Sunday’s event was attended by government representatives of numerous countries including Canada and Belgium, and a number of French lawmakers and self-described human rights activists. During the event, Allyan slammed Israeli police officers for neutralizing Ghassan Abu Jamal during the massacre, accusing them of using the attack as a “pretext” for an extrajudicial killing.